The next Invitational entry comes from Legatho, who made an Auction Merchant and a suitable entourage to follow him on his journeys. =][= 25 The chrono-gladiator is based on an old saurus body, with kroot legs, a mutated arm from the cahos mutation sprue, a nob power claw and the plastic chaplain head. The coice of the body is to reveal the weakness of his left arm that he never use. 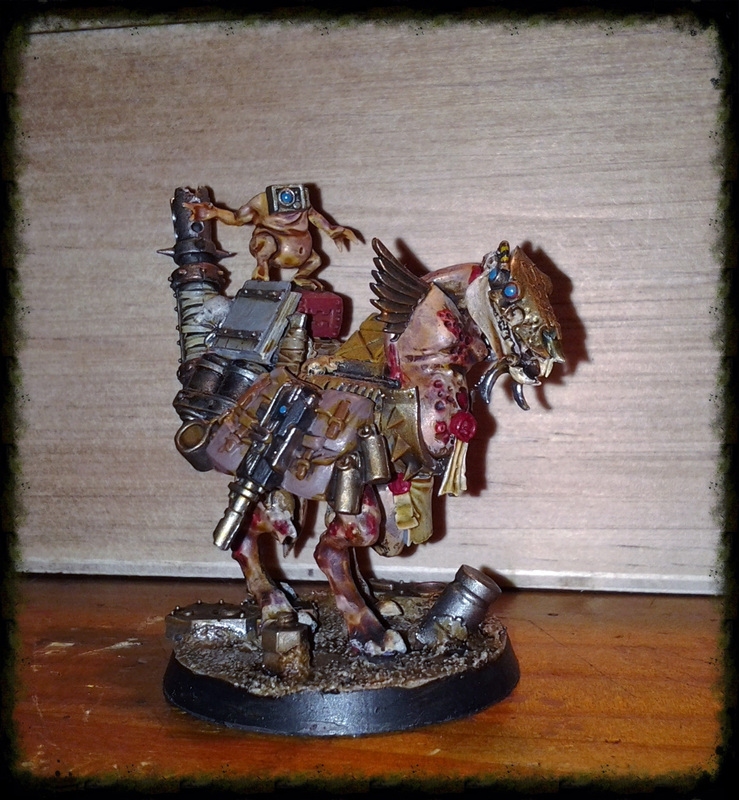 =][= #40 The mule is based on a dreadknight weapon breach with two pairs of bloodletter legs. The body is from the plaguebearers and the horse head from the black knights. Wanted to keep a piece of JB’s mind with this…. Until now, it’s one of the creaziest mini I’ve ever done. The cherub is a nurglin with a Apothecary sensor. =][= #60 The mechanic chair is mostly made with killa kans bitz. Two pair of legs to make it higher and two scions radiant guns fronts. 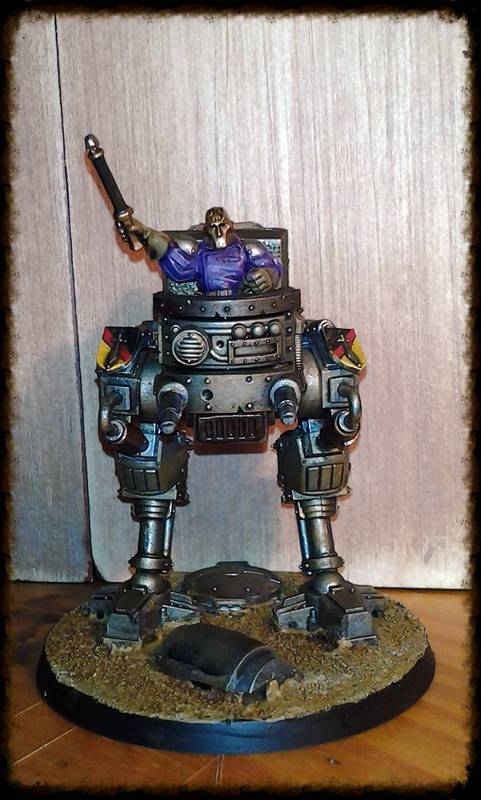 The Auctioneer is based on an imperial tank commander with Empire general arms and a sorcerer head. All these were combined with extra bitz from flagellants, grey knights, bullgryns, nobz and space marines. Thank you ! Not as insane as I planed in the begining… but still working on it. Yup, definately insane. That horse skulked beastie is all kinds of madness in one miniature. Love it! The mule is definitely insane and my favorite of your trio. It is also eerily similar to my first Invitational mockup trio – one of them was called mule even! I’ll get back to that project but at the moment I’m expanding the Merciless crew and I’m slowly getting a second INQ28 project off its feet. Working title is the Traveller. I absolutely love the mule, it capture the insane essence of 40K. I think it’s genius how you built a horse without really using bitz of an actual horse model (apart from the head). Awesome concept and execution! I love how the Warhammer 40k universe can accommodate such a broad range of ideas, concepts and characters. These guys fit perfectly as a rogue and twisted merchant, maybe in the distant Halo Stars? As many have said earlier, my favorite is the Mule too. It really speaks to the bizarre horror that persists in the universe of 40k. 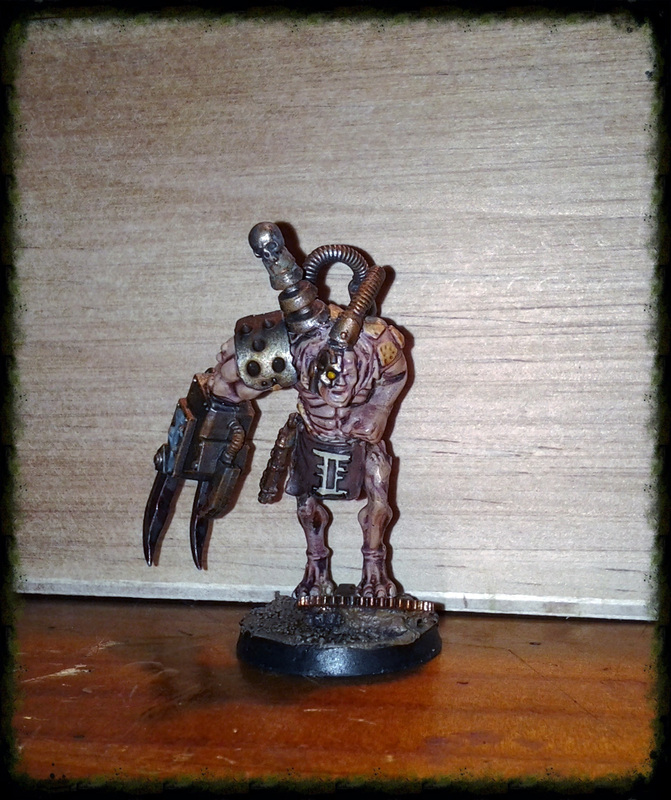 The little techno-nurgling on the creature’s shoulder is a great addition. Hopefully you can expand the merchant guild in the future! The Merchant Guild is a great concept to build upon, and that mule is a batsh** crazy model that somehow fits perfectly within it. Thank you all for those words… I’ve planed something more crazy and weird on the auctioneer, but the time was missing… I’ll nearly rework on him and I’ll show the final result..
Great trio Legatho! But, as others have said, the mule takes the cake. It’s really the epitome of blachean grimdarkyness. 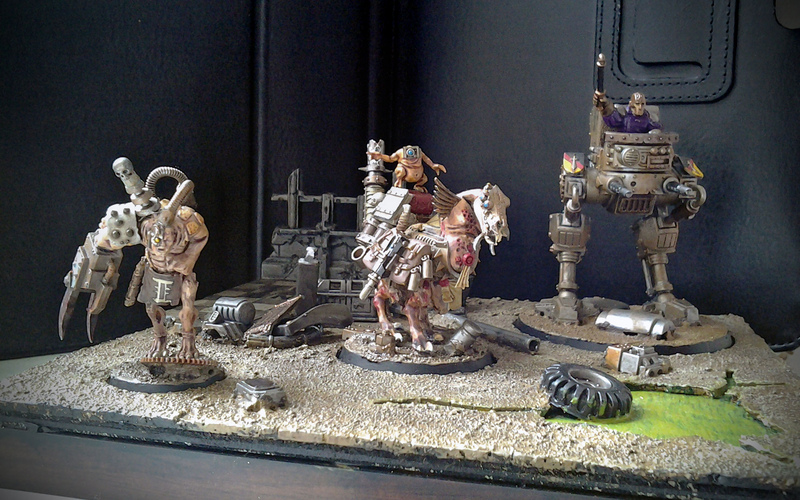 Love the little servocherub – simple but effective conversion! Thanks buddy, I’m happy with the mule results, it is exactly what I’ve planed for it…. and thank you for the “epitome” ! Love that Auctioneer and his pack mule! Great idea and wonderfully executed. A good one. Thank you Migs, go to see you like them…. By the way, as I told on my blog, thank you to the Sleeters for creating this event, and “Bravo” to all the artists… it really was some kind of journey and can’t wait for the next ! is it me? or does the auctioner’s right arm look slightly to low on his body? noticing it broke any spell these miniatures may have had, sorry to say, but it’s not the best entry, not the worst, but not the best.